Update: Our blarty was a total success! For those of you who are unaware, “We’re Calling Shenanigans!” turned one year old on Saturday, so we had a blog party (“blarty”) to celebrate! A bunch of our friends showed up to take part in our birthday shenanigans, and it was just a grand old time. 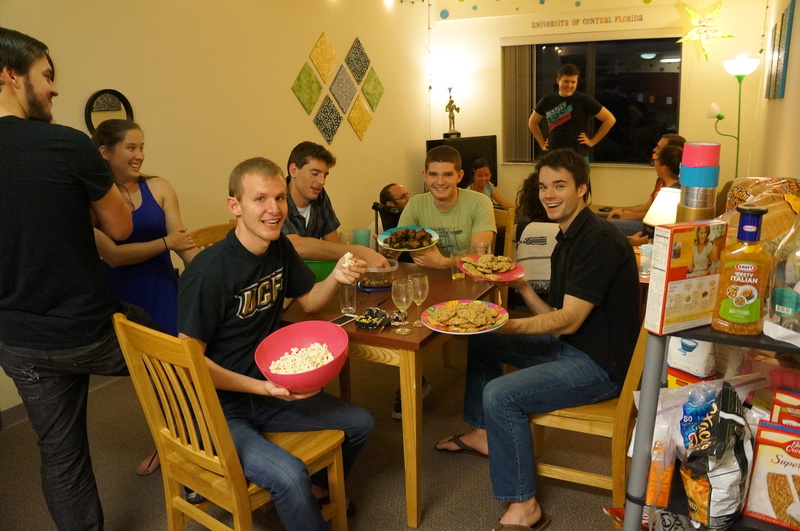 We had a TON of snacks and games, and Kristen and I felt very Susie Homemaker in our matching aprons mixing drinks. Of course, to go along with the theme, and we do love a good theme, we had birthday cake ice cream, birthday cake cookies and the very popular birthday cake popcorn! 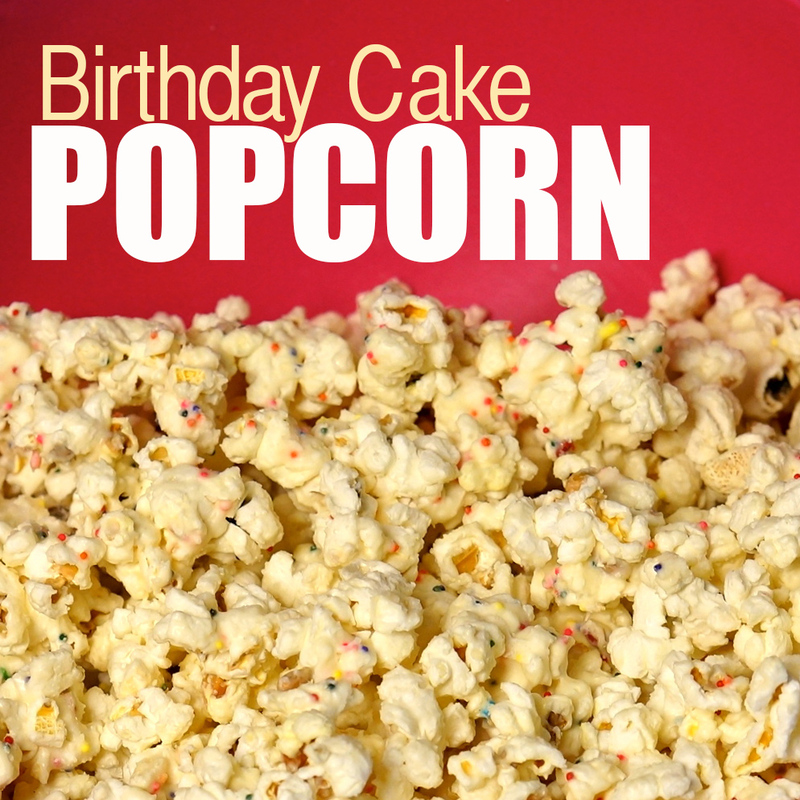 We found this birthday popcorn recipe on Pinterest while we were looking for party ideas, and it caught our interest. In a sea of cakes, cake pops and cupcakes, this Funfetti popcorn was just the out-of-the-box snack we wanted! Interested? You should be- this popcorn might very well be the ever-elusive perfect sweet-and-salty snack. Plus it involves rainbow sprinkles. So let’s get crackin! 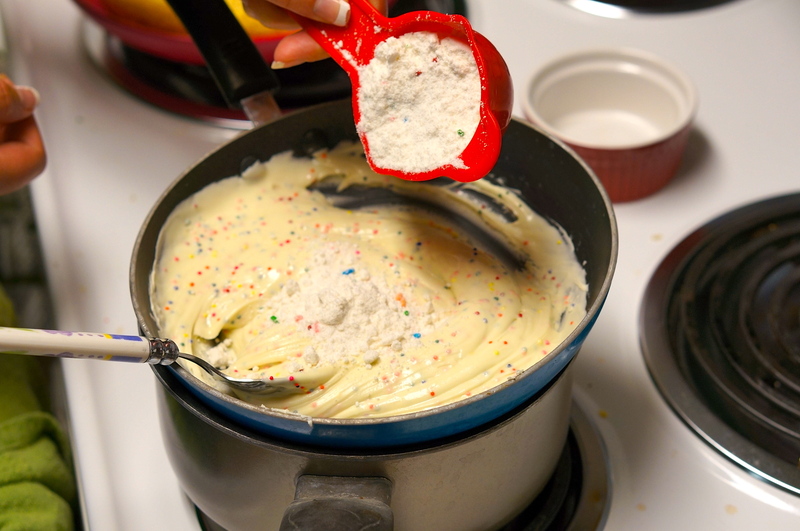 Measure out your sprinkles and Funfetti cake mix. This will make your life easier once your chocolate is melted, we promise. Pop your popcorn and put in in a big bowl. A really big bowl- you’ll be mixing it later and you don’t want it flying across the kitchen and ending up anywhere but your mouth. 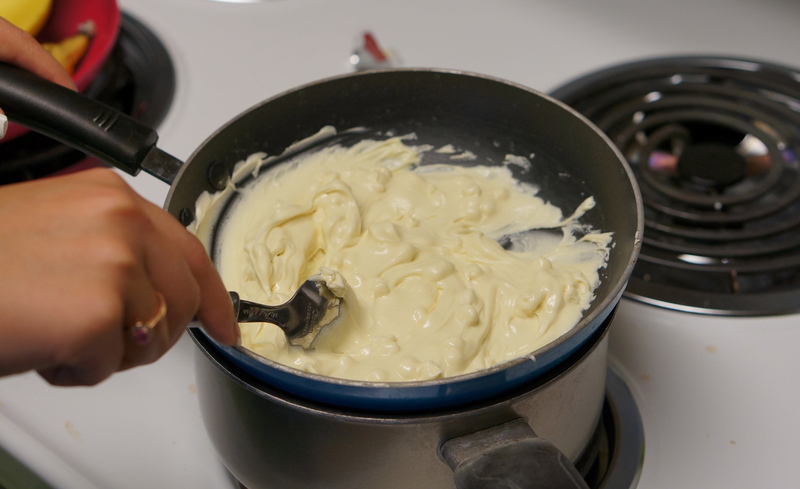 Now, melt your white chocolate using a double boiler. 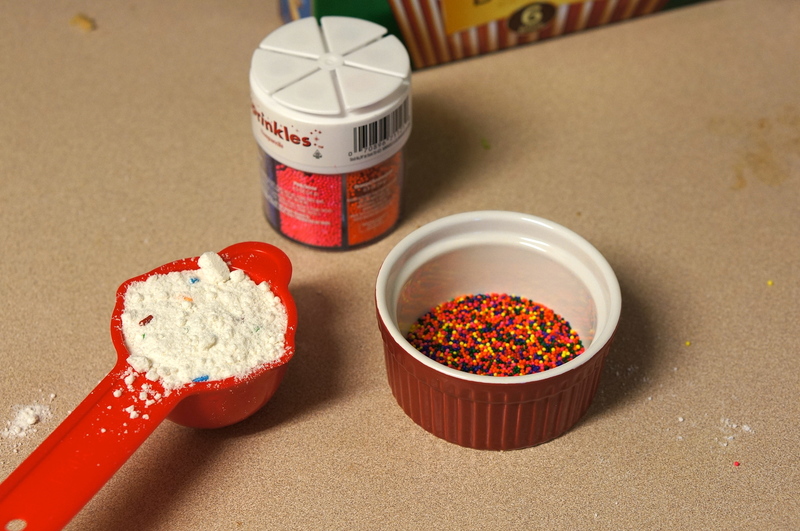 Once the chocolate is smooth, mix in your sprinkles. 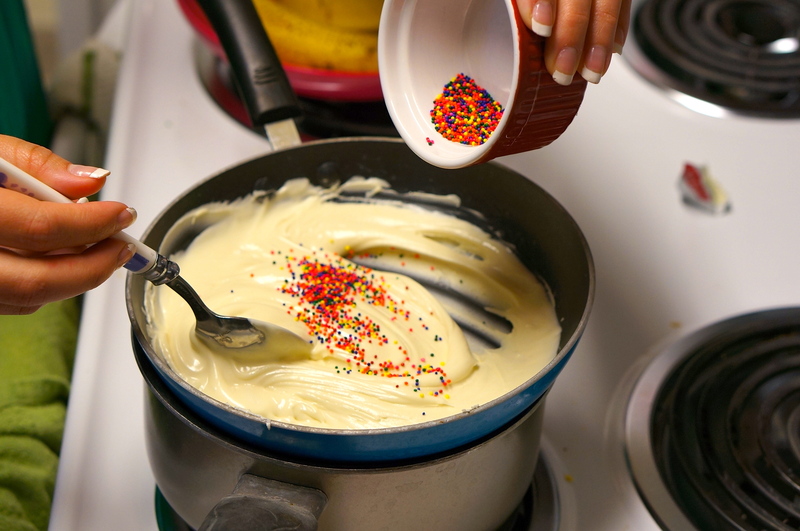 We really like sprinkles (so sue us), so we actually added in twice as many as the recipe called for. We’ll take this moment to tell you to make the recipe your own! May we suggest Mini M&Ms? You can really throw in anything you’d like. 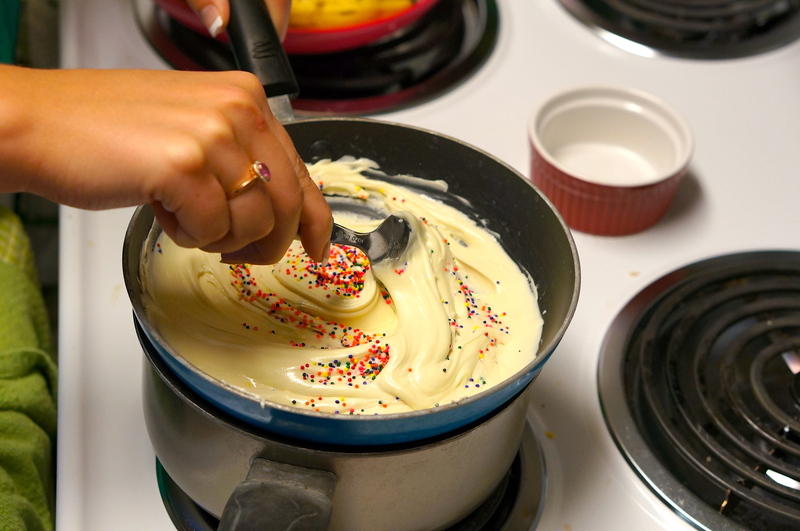 Now, stir in your Funfetti cake mix. This is where you’re supposed to start putting the chocolate mixture on the popcorn. We attempted, ended up in a pretty big struggle, and had to return the chocolate to the double boiler. 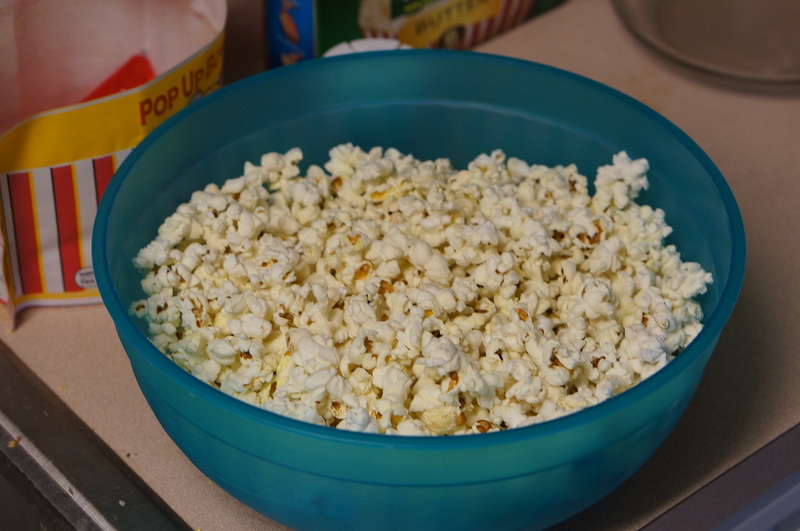 It was just too thick to evenly coat the popcorn, so we reheated it and added in some olive oil to thin it out. This made all the difference in the world, so if you find yourself in a similar predicament, don’t worry! Olive oil is your friend! Here’s where you’ll get a little bit messy. If you’re like me, you just got way more excited about the recipe! If you’re more like Kristen, you probably just navigated away from this page. 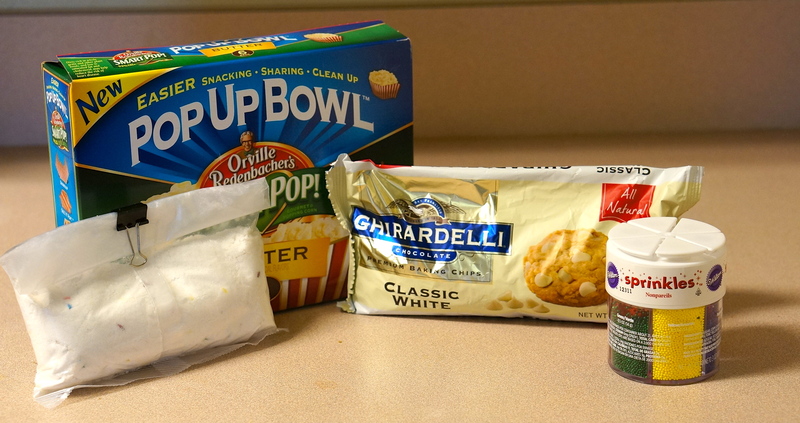 The original recipe said to mix the chocolate into the popcorn using a spoon, but take it from us: that did not work! You’re just gonna have to get right in there and mix it up with your hands (after washing them of course!). It worked best for us when we added the chocolate in a little at a time and mixed it in, slowly coating all of the popcorn. 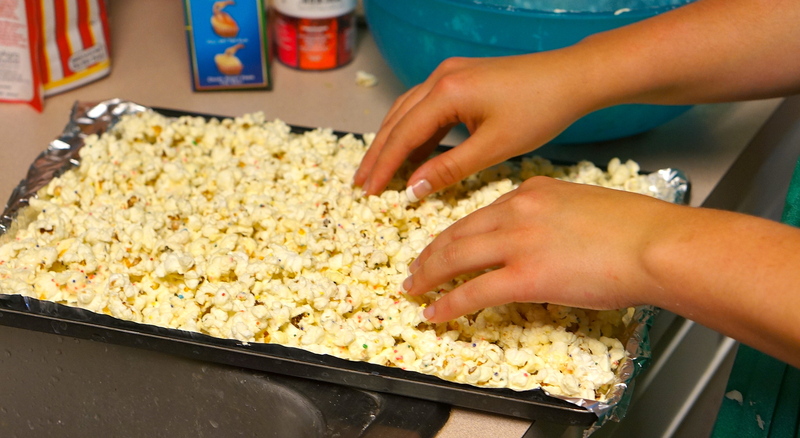 Once you’ve added in all the chocolate, spread the popcorn out on a flat surface (for us, baking sheets covered in aluminum foil). 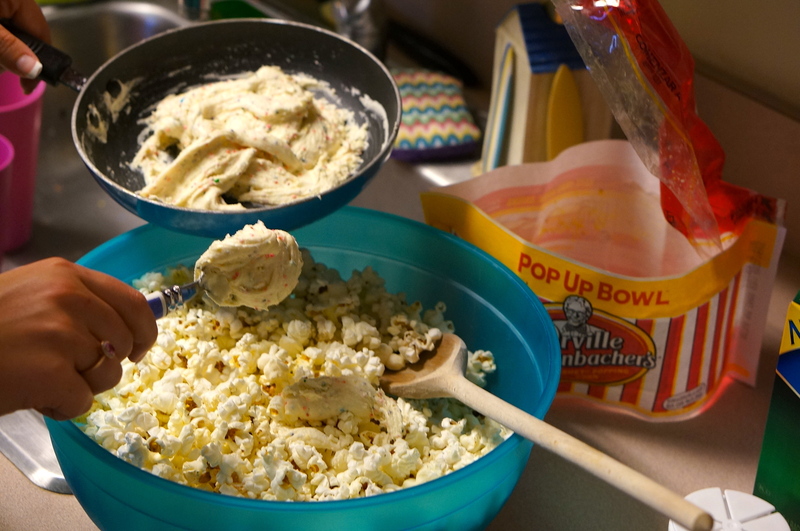 Once the popcorn has cooled, break it up and move it into a bowl to serve. We loved this yummy shenanigan! It was salty, sweet, sticky and crunchy- pretty much everything you could ever want. Plus, making it was pretty quick (important when you’re on a time crunch getting ready for a blarty). Aww, see how happy our friends look! These guys have been great supporters of the blog over the last year, and we can’t thank them enough! We revoke our shenanigans- this recipe worked great! All in a day’s work, folks. Shenanigans great party idea! How creative! Sweet n salty love that mix.